Today we will discuss about stepper motor, its working, types, advantages, disadvantages with it functional area. In simple words, it is a combination of DC motor with electronics technology which allows the motor to rotate and stop at specified angle. It is mostly used in robotics where move the arm of robots at specified angle and hold there for some time and get back return after it. This is a brushless electromechanical device which is used to convert the series of electric pulses applied at their excitation winding into precisely defined step by step the mechanical shaft rotation. In others words, the stepper motor is an electromechanical device which converts electrical power into mechanical power. It is a particular type of DC motor that does not rotate continuously, but a full rotation is divided into the number of equal steps. It works on the principle that, the theory of operation for magnets to make the shaft turn the precise distance when a pulse of electricity is provided. In a stepper motor, number of input as pulses given to the motor decides the steps angle and hence the position of the shaft is controlled by controlling the number of pulses. These unique features that is different from the servo motor make the stepper motor to be well suitable for open loop control system wherein the precise position of the shaft is maintained with the exact number of the pulses without using a feedback sensor. If the steps angle is smaller, then the greater will be the number of the step per revolution and higher would be the accuracy of the position obtained. The step angle can be as large as 90 degrees and as small as 0.72 degree, however, the usually used step angles are 1.8, 2.5, 7.5 and 15 degrees. Stepper motor is made up of the stator and rotor. The rotor is the movable part which has no winding, brushes and a commutator. 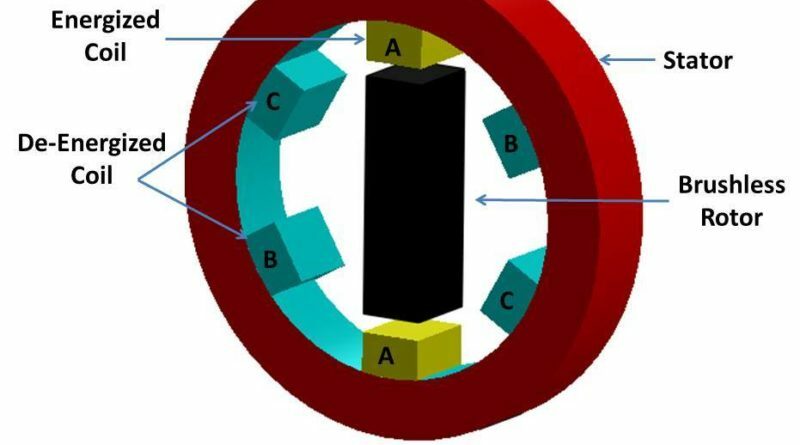 The stator is made up of multipole and multiphase winding, usually of three or four phases winding wound for a required number of poles decided by desired angular displacement per input pulses. 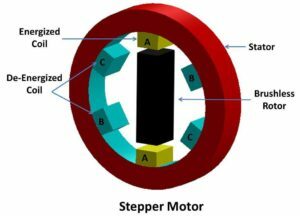 Stepper motor works on the principle of electromagnetism. The magnetic rotor shaft is surrounded by the electromagnetism stators. Rotor and stator have poles which may or may not be teethed depending upon the types of the stator. Whenever the stators have energized the rotor, it moves to align itself along with the stator. In this fashion, the stators are energized in the sequence at different poles to rotate the stepper motor. Due to the very good control of the speed, rotation, direction and angular position, these are of particular interest in industrial process control system, CNC machine, robotics, manufacturing automation system and instrumentation. Variable reluctance stepper motor has the simple design with soft iron, non-magnetic toothed rotor and wound electromagnetic stators. No attraction between the rotor and stator winding when the winding being energized since the rotor is not magnetised. When an opposite pair of winding has current switched to them, a magnetic field is produced with lines of force which pass from the stator poles through the nearest set of poles on the rotor. It gives the steps angle of 7.5 or 15 degrees. Permanent magnet stepper motor has a permanent magnet rotor that is axially magnetised. It means that it has alternating north and south poles parallel to the rotor shaft. Each pole is wound with a field winding, the coils on opposite pair of poles in series. Current is supplied from D.C source to the winding through switches. The rotor is a permanent magnet and thus when a pair of the stator poles has a current switched to it the rotor will move to line up with it. steps angle of this motor are 1.8, 7.5,15,30,34 and 90 degrees. The hybrid stepper motor is the combination of both permanent and variable reluctance motor. It has a permanent magnet, toothed rotor made up two sections or cup, which are opposite in polarity and whose teeth are offset to each other. The rotor set itself in the minimum reluctance position in response to a pair of stator coil energised .Step angle of this motor are 0.9, or 1.8 degrees. You can also watch this video to understand the different types and working of stepper motor. The rotation angle is proportional to the input pulses. Very low-speed synchronous rotation is possible to achieve. There are no brushes so it is reliable. Speed is directly proportional to the frequency of the input as pulses; hence a wide range of rotational speed can be realized. Low speed with high precision. Difficult to operate at very high speed. For the smooth move, micro stepping is required. Aerospace industry especially in avionics. This is all about stepper motor working, types etc. If you have any query regrading this article, ask by commenting. If you like this article, don’t forget to share it on social networks. Subscribe our website for more informative articles. Thanks for reading it.